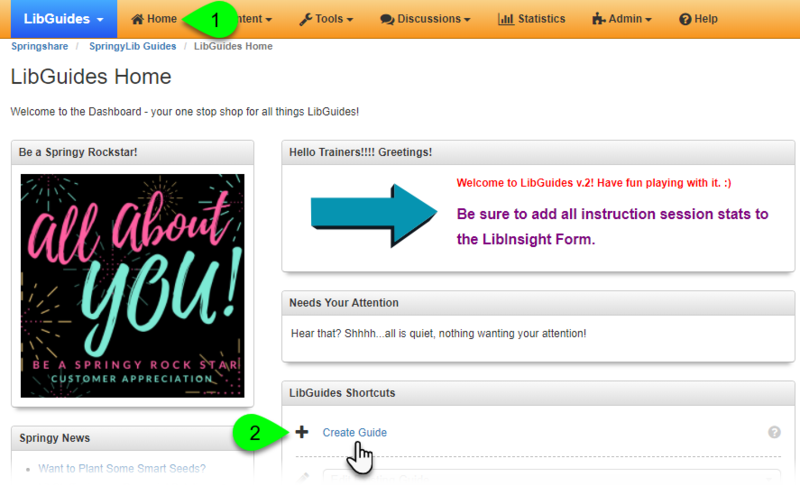 A quick way to create a new guide is via the LibGuides dashboard. If you've logged into LibGuides, then this is usually the first page you see. However, to get there at any time, simply click on Home in the orange command bar. Then, in the LibGuides Shortcuts box, click on the Create Guide link. You can also create a new guide via the Content > Guides page. Once there, just click on the Create Guide button. Once you've arrived at the Create New Guide page, you're ready to set up your new guide. To create a guide from scratch, select "Start Fresh" from the Choose Layout or Reuse dropdown. If your admin allows you to select your own guide layout template, use the Templates dropdown to select your preferred template. A Tab Layout template will use a tabbed navigation menu at the top of the guide. A Side-Nav Layout template will use a two-column layout, with a navigation menu on the left and the guide content on the right. If you're not sure what to pick, don't worry: you can change this at any time. If this dropdown menu is disabled, however, then that means your admin is requiring all guides to use a specific template. For the Guide Name, enter a title for your guide. This will display in the guide's page heading and breadcrumbs, as well as in the guide lists on your LibGuides homepage. You can provide an optional Guide Description to provide a brief intro to the guide. This will display below the Guide Name. 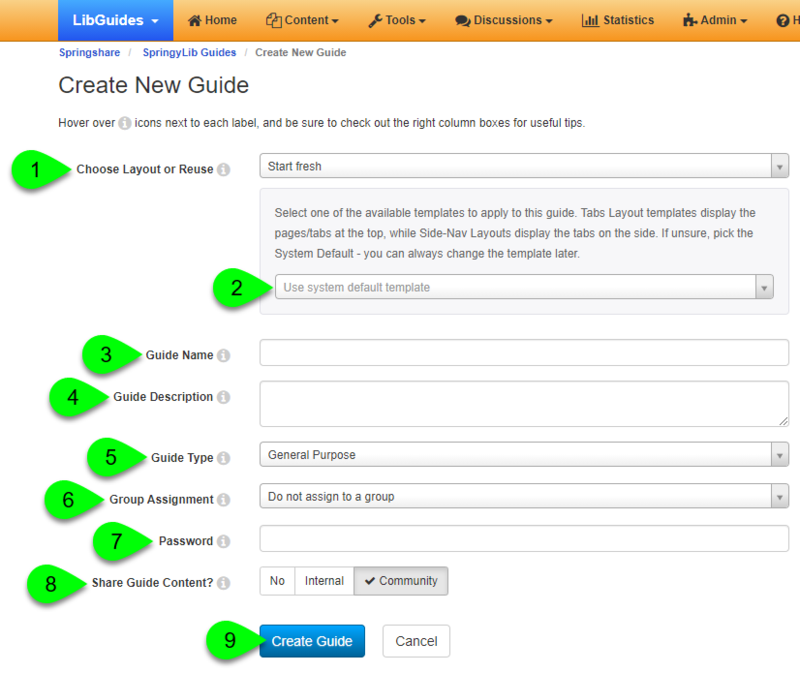 Group Assignment: if you have LibGuides CMS, you can choose to assign your guide to a specific group of guides. Password: if you have LibGuides CMS, you can require users to provide a password before they can view your guide. 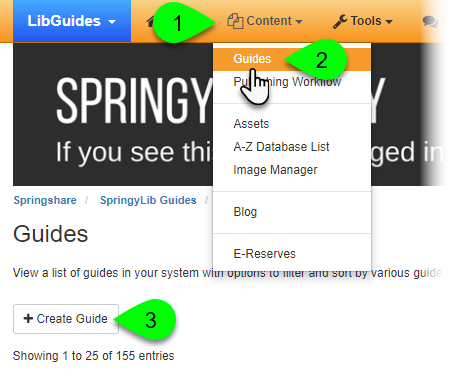 Community: if your admin has enabled sharing with the LibGuides community, this will allow other users from other LibGuides sites in your region to create copies of your guide. Internal: this will allow only users from within your LibGuides sites to create a copy of your guide. Users from other LibGuides sites will not be able to do so. No: this prevent any user (internal or community) from creating a copy of your guide. Requested By (LibCRM): if your library subscribes to LibCRM, this will allow you to record who requested this guide to be created. Click on the Create Guide button. General Purpose: this is the default and a good catch-all for most guides. Course Guide: this is ideal for guides that are related to a specific course. Subject Guide: this is ideal for guides that are focused on a specific subject area. Topic Guide: this is ideal for guides that are focused on a specific topic. Internal Guide: this is ideal for guides that are for internal use only. When using this guide type, please keep in mind that your guide will not appear in guide lists or search results. This will not completely hide the guide from the public, however. Published and private guides assigned to this type can still be viewed by anyone who knows its URL. Template Guide: this is ideal for guides that you intend for other users to copy as blueprints. When using this guide type, please keep in mind that your guide will not appear in guide lists or search results.